Jesse Woodson James (September 5, 1847 – April 3, 1882) was an American outlaw, gang leader, bank and train robber, and murderer from the state of Missouri and the most famous member of the James-Younger Gang. Already a celebrity when he was alive, he became a legendary figure of the Wild West after his death. Some recent scholars place him in the context of regional insurgencies of ex-Confederates following the American Civil War rather than a manifestation of frontier lawlessness or economic justice. Going down in history as one of America’s most relentless outlaws, Jesse James robbed banks in Missouri, Kentucky, Minnesota, and Illinois, and caused a great rise in confederate support in his home state. From age 16 until his death, he was one of the Midwest’s most feared criminals. Born to a minister named Robert James, who passed away when Jesse was young, James decided to take the trodden path of a bushwhacker when Unionists killed his stepfather. He joined his brother Frank on a Unionist military killing spree. They were first denounced as public enemies when they became prime suspects in the Centralia Massacre, in which nearly 25 Union soldiers were killed point blank. During the civil war, the James brothers continued their raids and killings, but after the war, with a bloody trail behind them, they didn’t know where to go or what to do. After being shot by Union soldiers and eventually regaining his health, Jesse James took part in his first bank robbery with his newly formed gang. They held up and robbed banks in any surrounding state. They pinpointed banks that were mostly involved in supporting the Union’s cause and banks controlled by anyone vaguely related to the North’s military. James even wrote letters that were published by the Editor of the Kansas City Times. Jesse became an instant hero for the confederates’ cause, but was considered a murderer and an outlaw by union soldiers. The Jesse James Gang began receiving death threats and in January of 1875, townspeople and detectives raided his farm, killed his half brother, and wounded his mother. The James’ decided to move to the outskirts of Nashville, Tennessee where they would be free from lynch mobs and others who wanted them dead. During this time, Missouri nearly passed a bill that would have given the James clan amnesty. Jesse James never gave up his life of crime. He put together another gang, with members who were not well experienced, and attempted to rob a large bank in Minnesota. While doing so, the bank manager refused to open the safe, which cost him his life. However, the ordeal took so long that an armed crowd had gathered outside to await the outlaws. The gang barely escaped, but a huge manhunt soon followed. Jesse returned to Missouri and lived under a fake name. While there, his longtime friends and gang members were paid by the governor to assassinate James for a large bounty. After James was shot in the back, the two collected their rewards. Legend has it that James escaped to Texas and changed his name. In 1948, Frank Dalton of Texas came forward claiming he was Jesse James. He died at the age of 103. James's turn to crime after the end of Reconstruction era helped cement his place in American life and memory as a simple but remarkably effective bandit. After 1873 he was covered by the national media as part of social banditry. During his lifetime, James was celebrated chiefly by former Confederates, to whom he appealed directly in his letters to the press. Displaced by Reconstruction, the antebellum political leadership mythologized the James Gang exploits. Frank Triplett wrote about James as a "progressive neo-aristocrat" with purity of race. Indeed, some historians credit James' myth as contributing to the rise of former Confederates to dominance in Missouri politics (in the 1880s, for example, both U.S. Senators from the state, Confederate military commander Francis Cockrell and Confederate Congressman George Graham Vest, were identified with the Confederate cause). In the 1880s, after James' death, the James Gang became the subject of dime novels which set the bandits up as pre-industrial models of resistance. During the Populist and Progressive eras, James became a symbol as America's Robin Hood, standing up against corporations in defense of the small farmer, robbing from the rich and giving to the poor while there is no evidence that his robberies enriched anyone other than his gang and himself, though they attacked small banks that benefited local farmers. In portrayals of the 1950s, James was pictured as a psychologically troubled individual rather than a social rebel. Some filmmakers portrayed the former outlaw as a revenger, replacing "social with exclusively personal motives." Jesse James remains a controversial symbol, one who can always be interpreted in various ways, according to cultural tensions and needs. Renewed cultural battles over the place of the Civil War in American history have replaced the longstanding interpretation of James as a Western frontier hero. Some of the neo-Confederate movement regard him as a hero. While his "heroic outlaw" image is still commonly portrayed in films, as well as in songs and folklore, recent historians place him as a self-aware vigilante and terrorist who used local tensions to create his own myth among the widespread insurgent guerrillas and vigilantes following the Civil War. 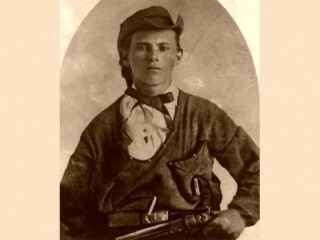 View the full website biography of Jesse James .